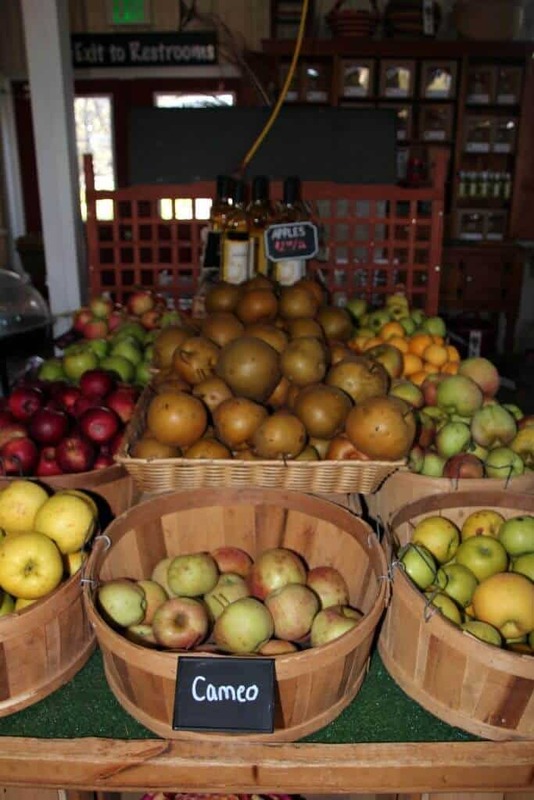 October is full of changing temperatures, pumpkin picking, visiting farms in Virginia and apple picking. 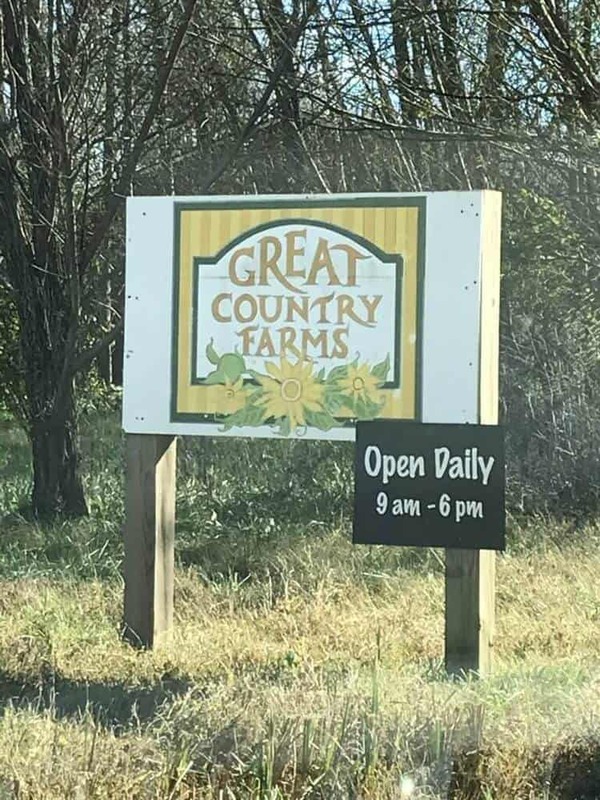 We decided to visit Great Country Farms on the suggestion of a friend of ours in Northern VA. I’ll give you all the insights into the farm, the animals, attractions, food and admissions. Check it all out below! 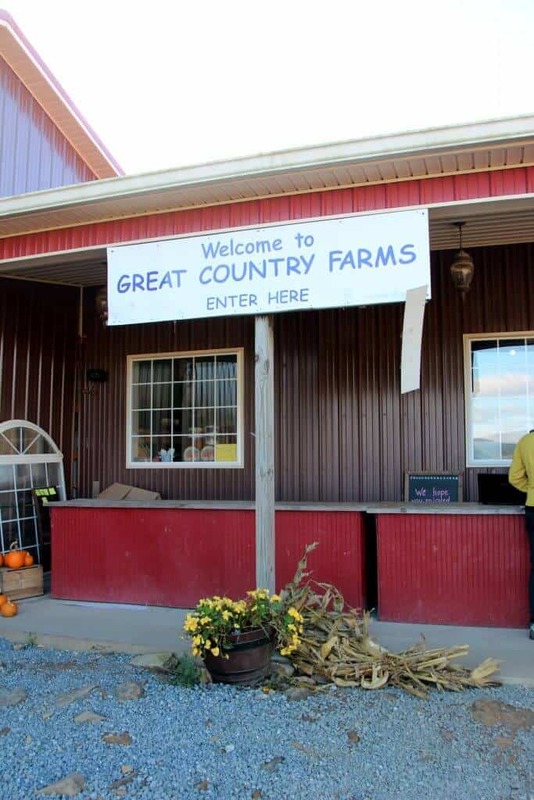 Where is Great Country Farms? 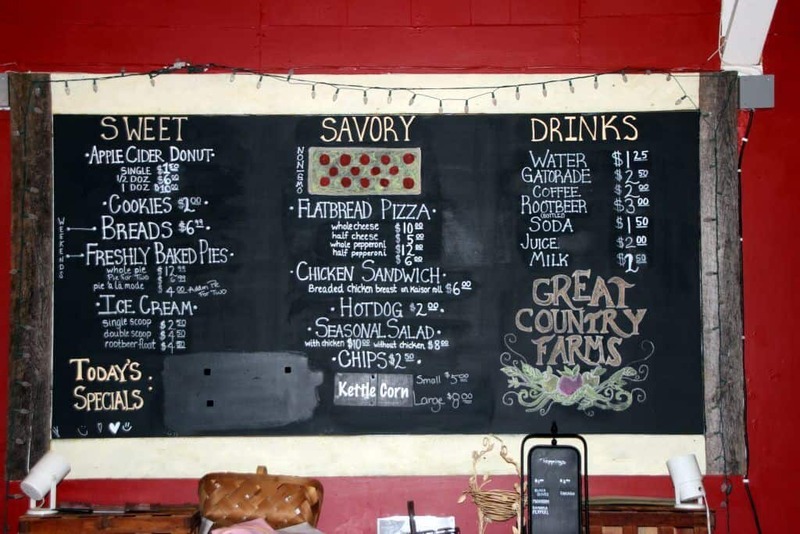 As you get closer to Great Country Farms, you’ll start to see signs for the Farm. 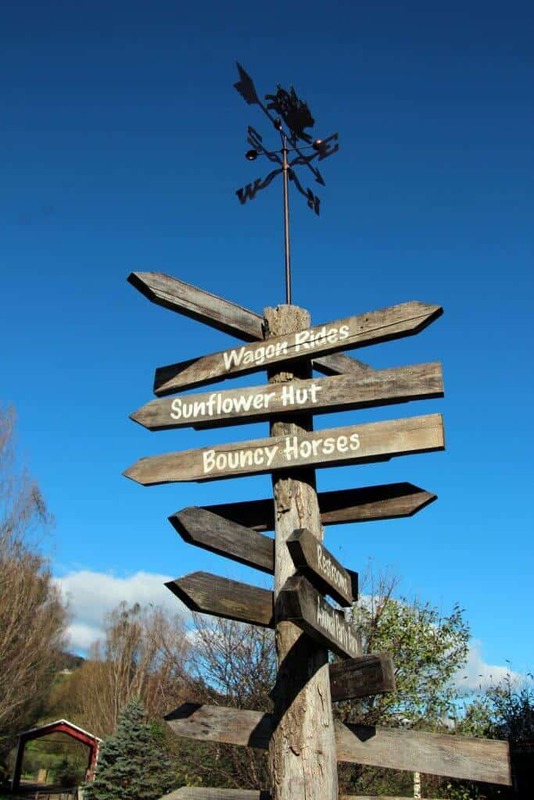 When you turn onto Foggy Bottom Road, you’ll see a large sign directing you to the parking area. 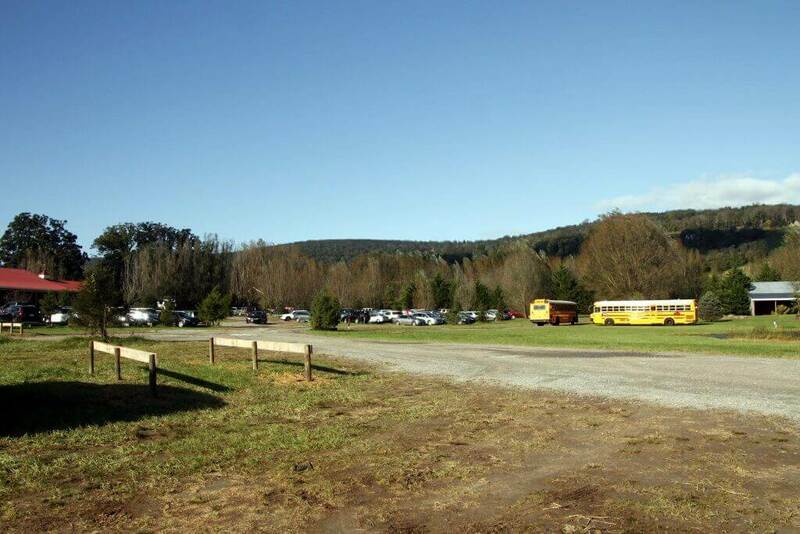 There are multiple large parking areas. It rained the day before, so we headed out into the field (where it was drier and less muddy). 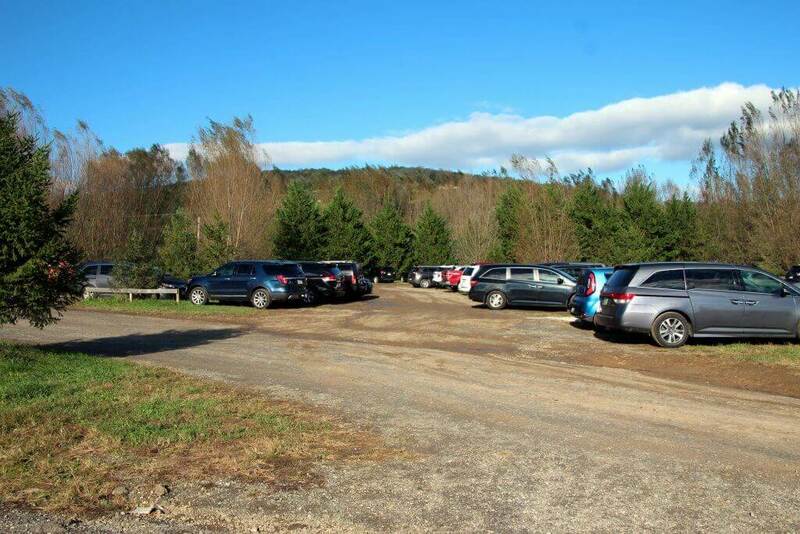 I can imagine that parking would fill on a weekend, so it’s always best to arrive early for easy parking. We visited on a Friday morning around 9:30 am. 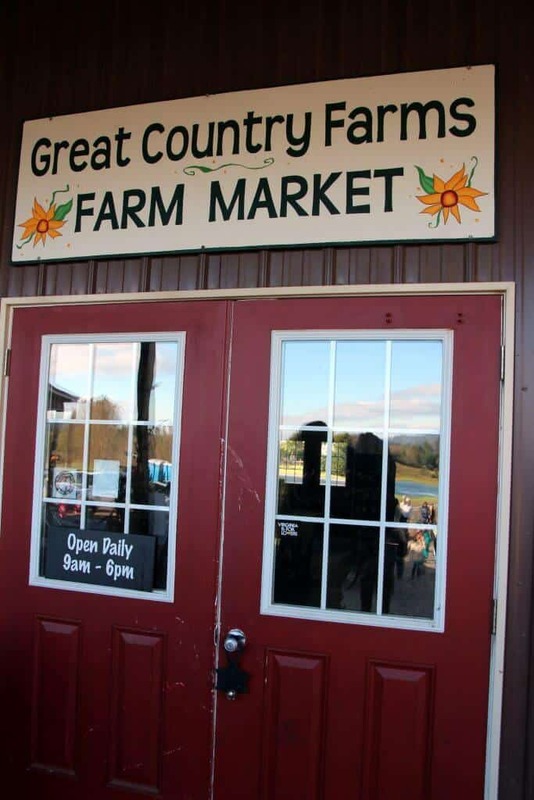 Once you park, head towards the entrance of Great Country Farms. You’ll see the signs. There is a place to pay outside, or you can go into the store if there is a long line outside. There were a few tour groups waiting to get their group stickers, so we skipped that line and headed inside to buy some coffee/hot chocolate (really good!) and some fresh apple cider donuts (more on those later). There is another cash register inside and they are also happy to sell you tickets. 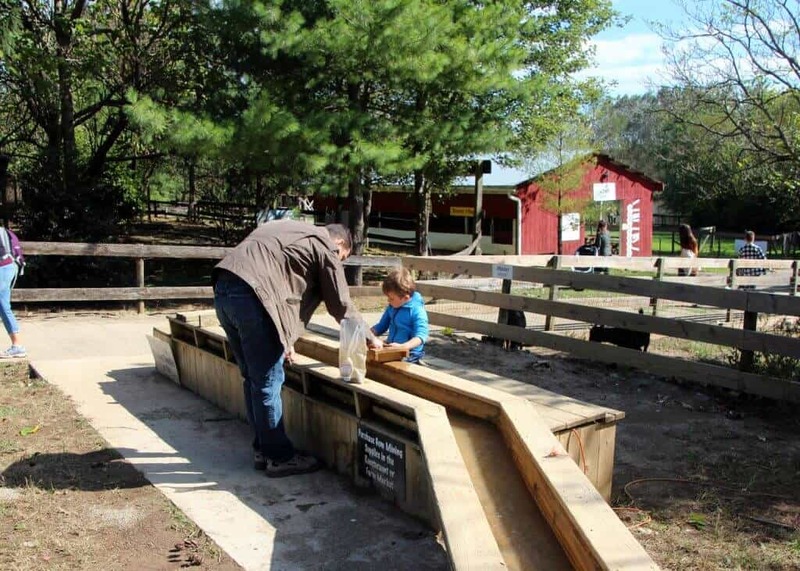 Admission rates: Great Country Farms Admission: $8/child & $10/adult; add $2 more during WEEKENDS. Military and their families are FREE with valid ID. They are open daily from 9am-6pm. Weekends also include more activities, such as live music, dino shows and marshmallow roasting. 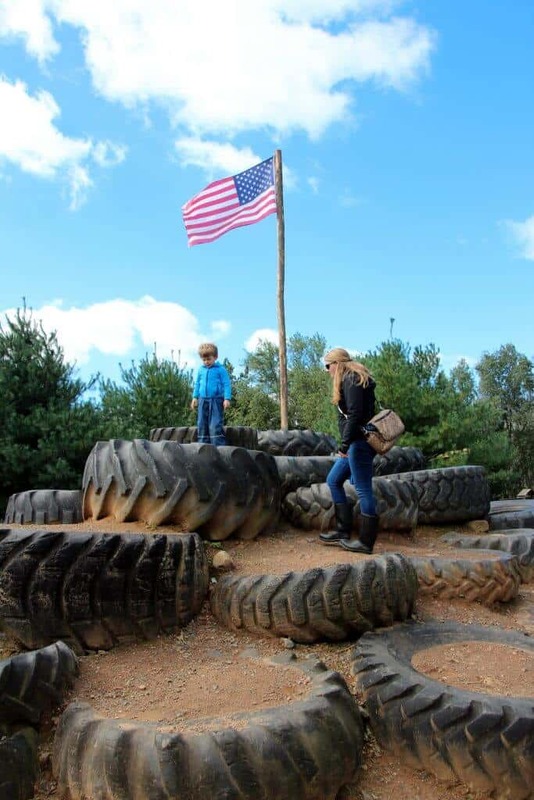 I’ve heard it can get pretty busy on the weekends, so be sure to arrive early and figure out which activities the kids want to do the most (so you can do those first). They are also a part of the Community Supported Agriculture (CSA) program. 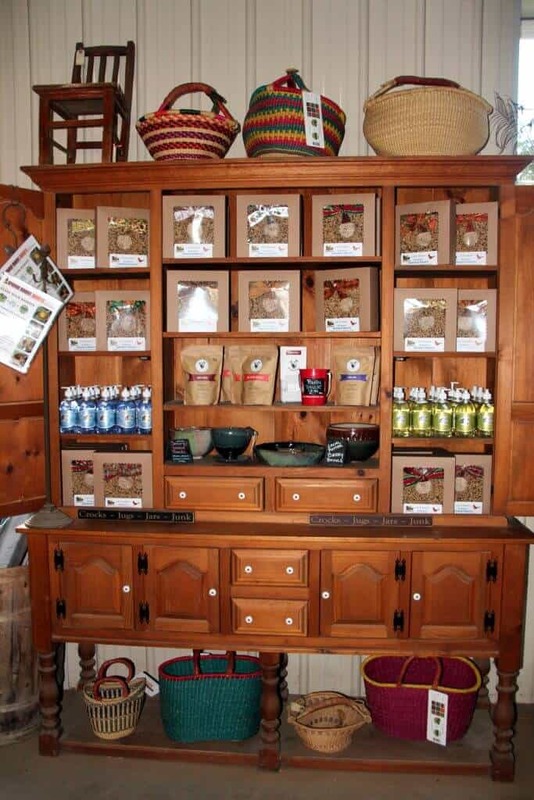 You can enjoy fresh and nutritious produce grown locally. 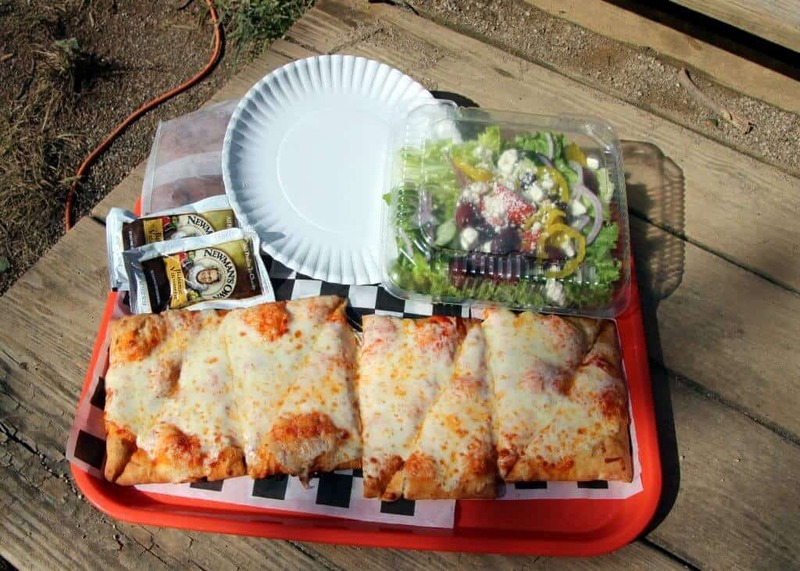 Check out their website for more details about “pick your own” and home delivery options. 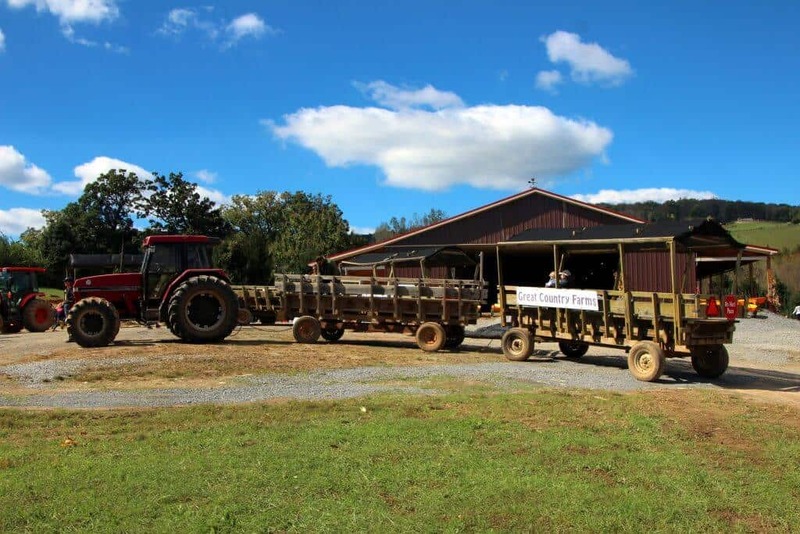 It is a large Farm, so plan to bring a stroller or baby carrier. We also saw a variety of wagons. Leave the umbrella strollers at home, the terrain is rocky, muddy and uneven. We didn’t end up bringing anything on this trip. 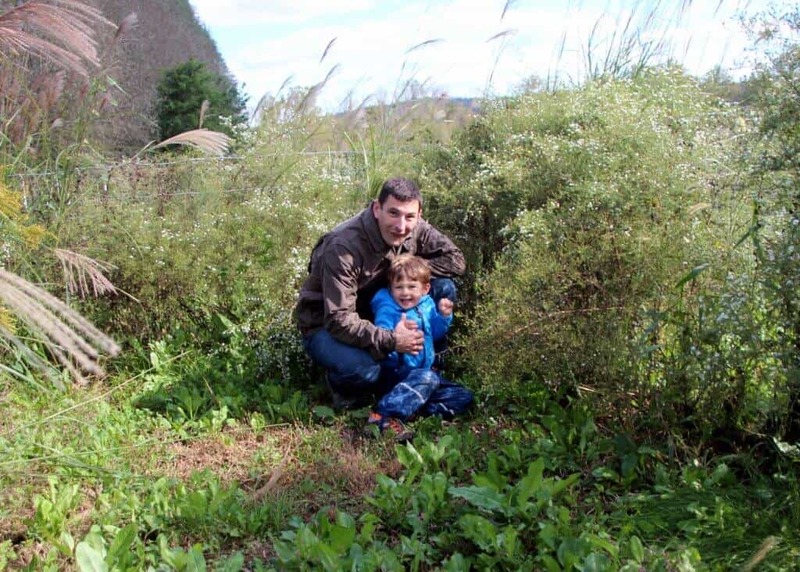 Now that our son is almost 4, he is good about walking (AKA running). I’d also suggest bringing mud clothes and play shoes so the kids can just have a great time playing. It’s a farm, so expect a bit of dirt. We always pack extra wipes for snack times and quick clean up. We love the packs from Babyganics because they smell like oranges and are soft on the skin. It is also a good idea to toss in some extra clothes into the car or backpack. My son wore his outdoor gear including rain pants (perfect for the wet slides). His current mud gear is from our time in Germany, but if you are looking for great mud gear, check out these products on Amazon. 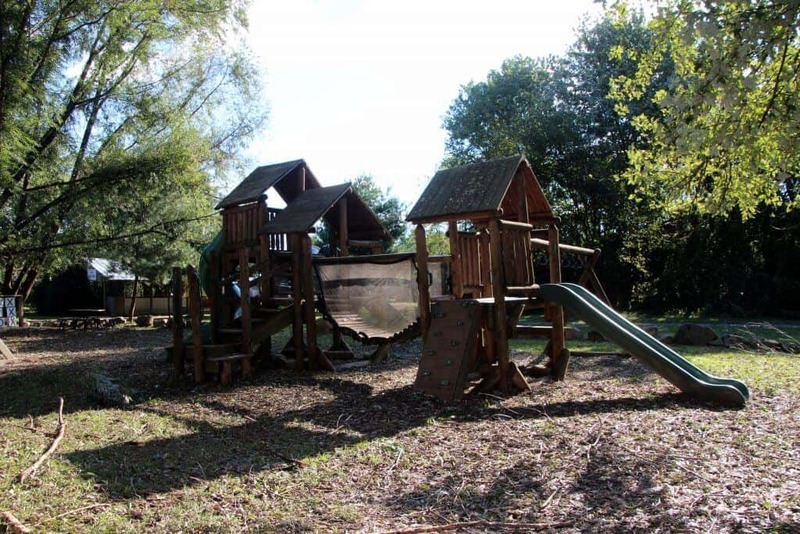 There is a huge variety of play structures throughout Great Country Farms. We decided to head left after heading out of the farm store. We passed the mining for gems area and the goats before discovering the huge jumping pillow. The jumping pillow is massive and well cared for. We saw many children enjoying a nice bounce later in the day. When we arrived, our son had the entire pillow to himself. We also liked the benches surrounding the pillow for the adults and younger children. Next, we headed off to check out the play structures. If you can think of it, Great Country Farms has it. The first area had a large castle with a slide. Close by was a fenced off area with a wooden Noah’s Ark and tractor. 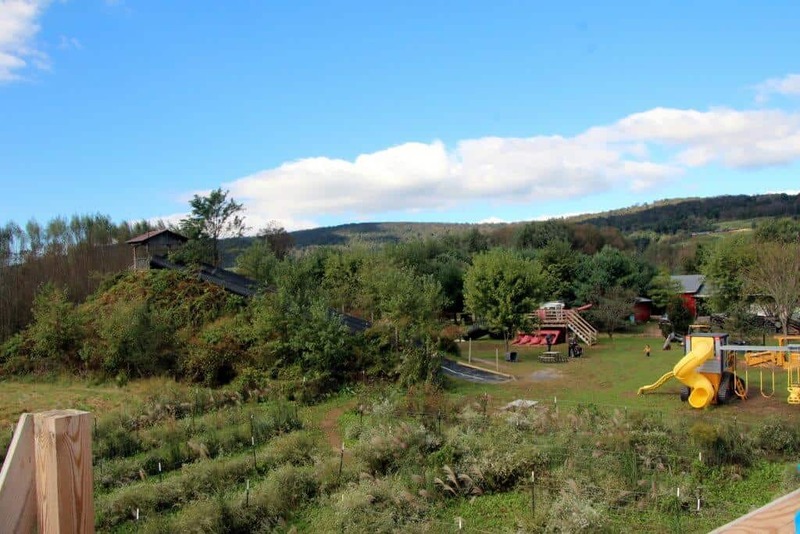 There was also traditional play equipment with slides, swings, rope bridges and more. 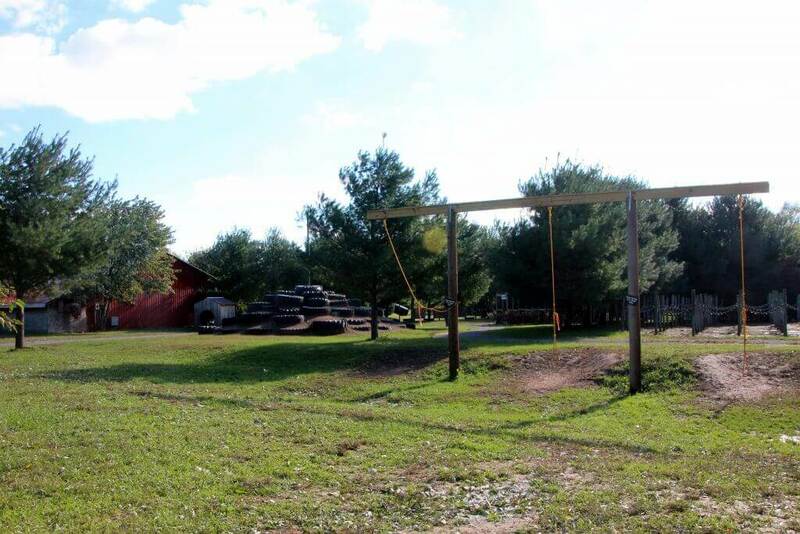 Beyond the first play area is a parc core style course. A storm had blown through the day before, so we didn’t venture over to explore since it was exceptionally muddy, but it looked really fun for the preschool/elementary crowd. After leaving the playground zone, we found a fun corn “crib”. 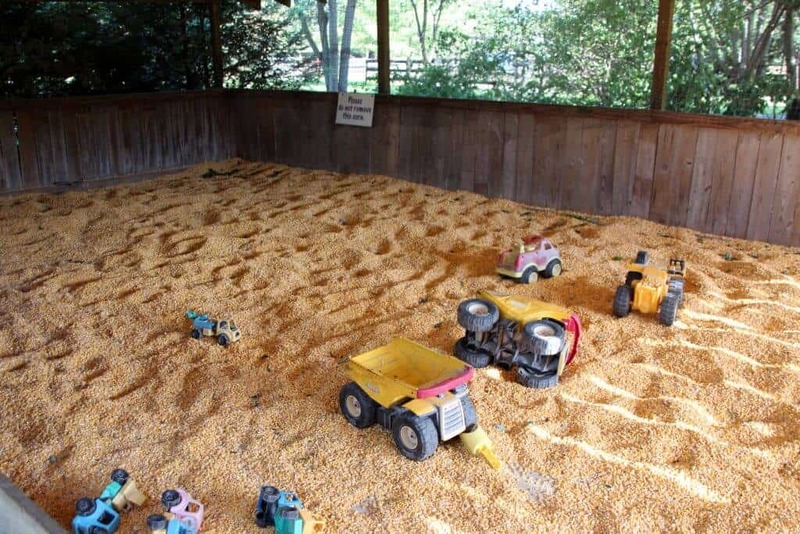 There are trucks and shovels to enjoy digging around in the corn. 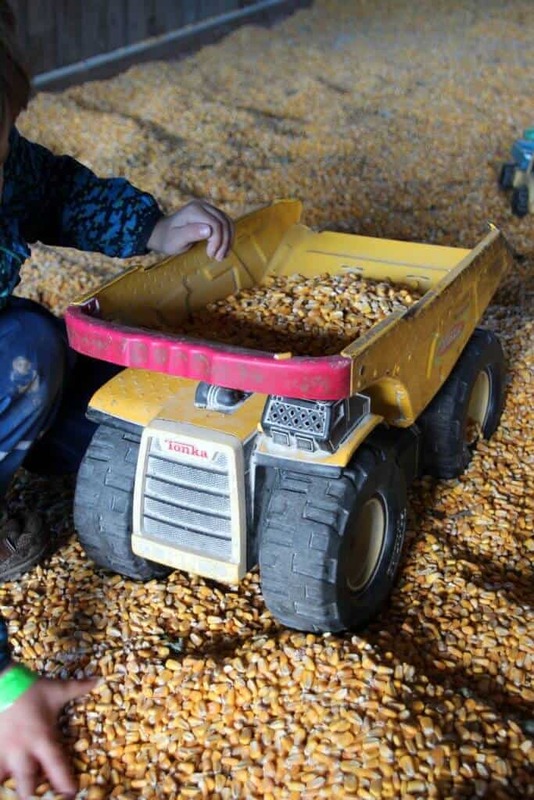 Filling dump trucks, making piles and having a fabulous time in the corn. 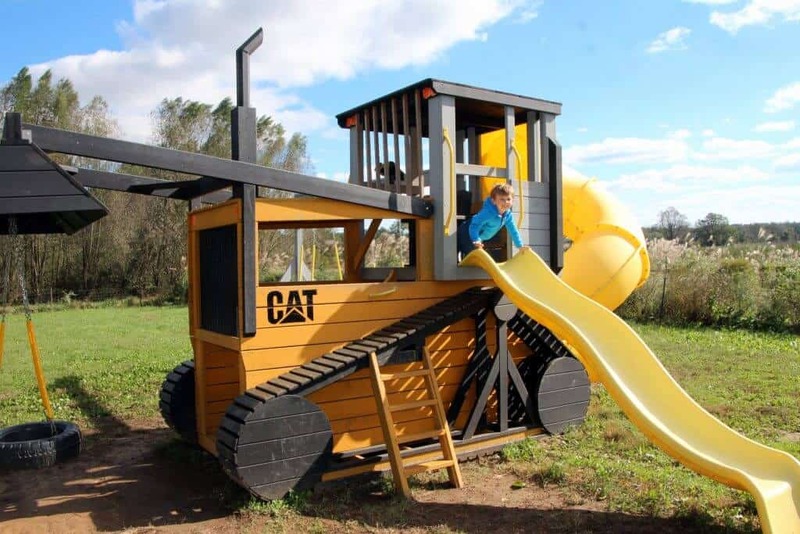 What little boy or girl doesn’t love a big dump truck?? After some digging and dumping, we headed over to the rope swings and tire pile. “Race you to the top!” my little one yelled. That’s a challenge kid! The play areas just kept coming! We found “memory” game boards, mazes of all types, huge slides and our son’s favorite: machinery to climb and pretend to drive! The helicopter climbing area was a delight and was nice since we had the whole place to ourselves for most of the morning. 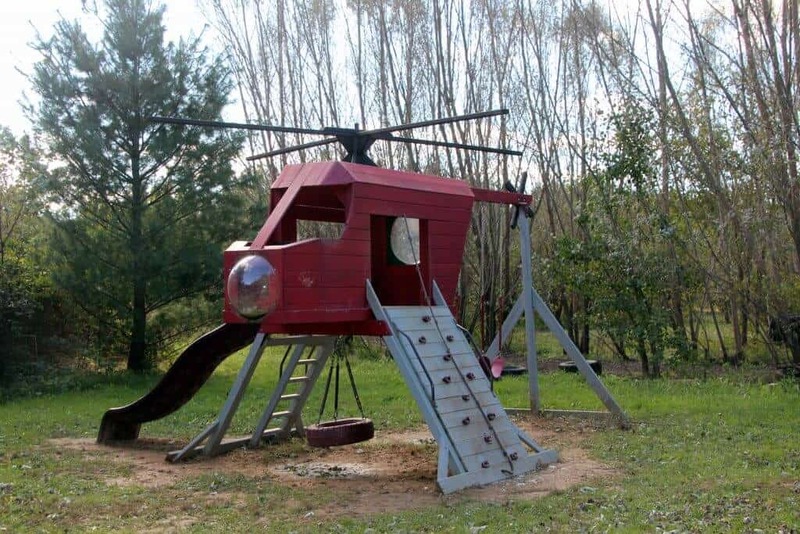 All of the play equipment was in good working order. You’ll have to supervise young pre-schoolers because there are plenty of places to fall, but precautions were taken to minimize the risk. We also had a great time racing each other down the long tube slides. 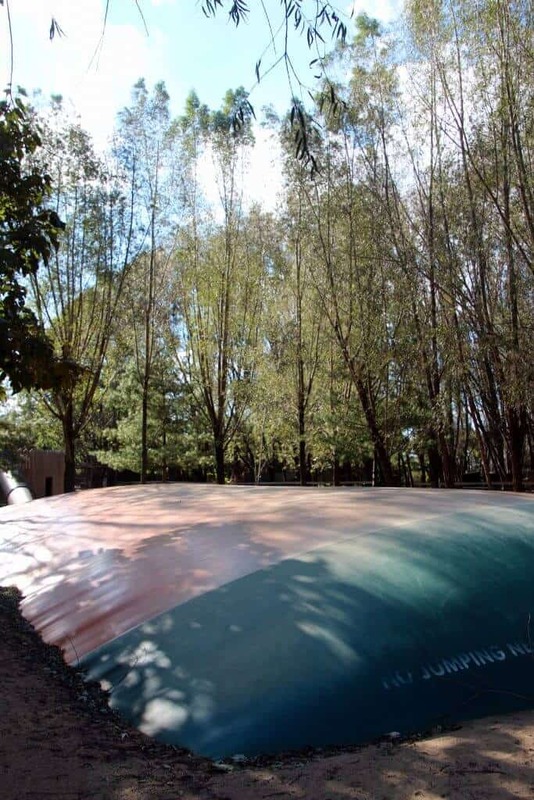 Watch out at the bottom, the mats can get pretty slippery (and wet after a rain). Those rain pants came in handy on my son. The slides were pretty slow, so don’t worry about little ones. My little one helping me down the slide (by my boots). 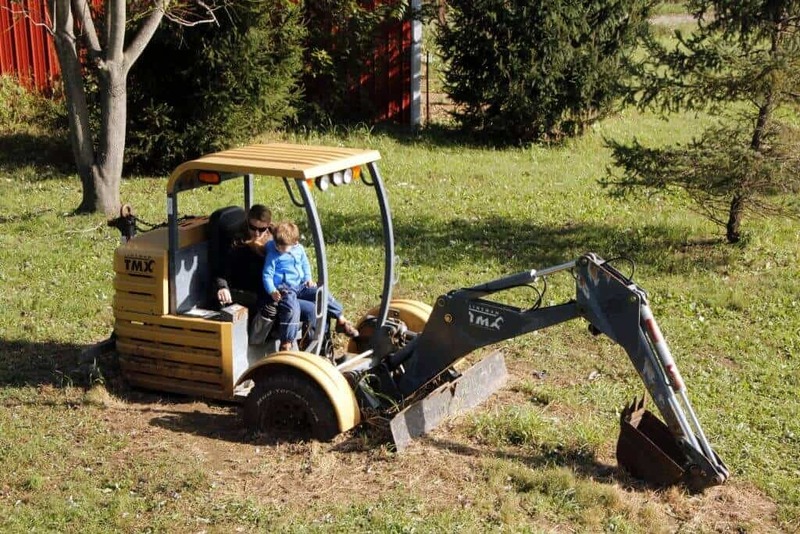 The energy never stops with a little one, so it was time to check out the excavator, digger, combine tractor and CAT. This was a favorite area to explore. It is located at the back left in a huge field. The sun helped to dry and slides and ground (so it was the least muddy of all the areas). Phew! Are you tired yet? No? Good, because it was time to play a fun game of hide and seek in the maze. 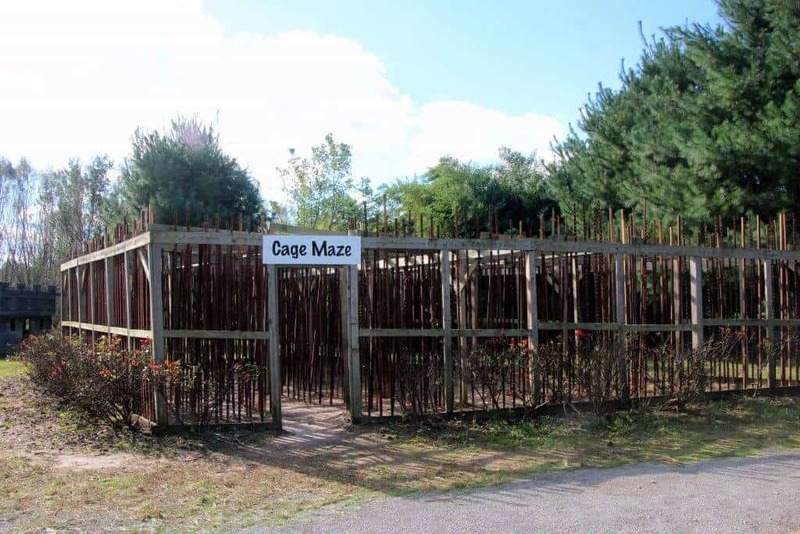 There are at least 4 mazes and I’m sure we didn’t even find them all. 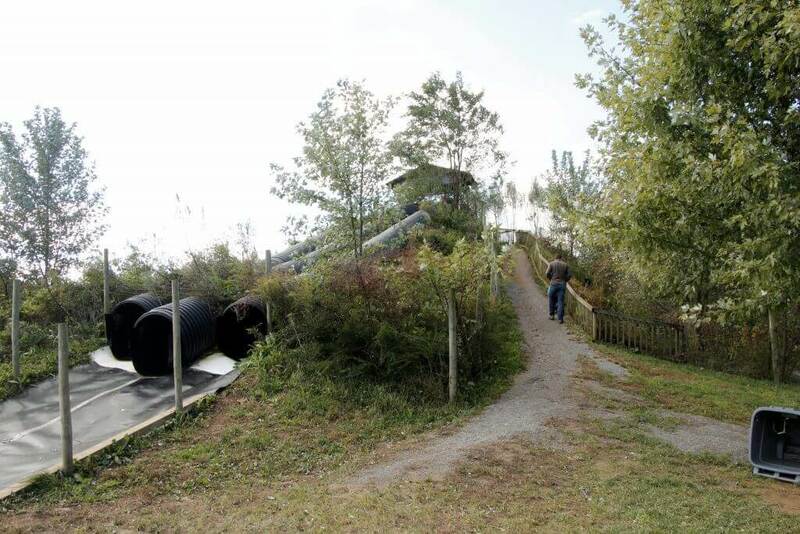 There are many different styles to explore, but we enjoyed the wheat/plant maze the best with its observation tower. Check out the views! It was finally time for lunch, but not before checking out the rolling carts. 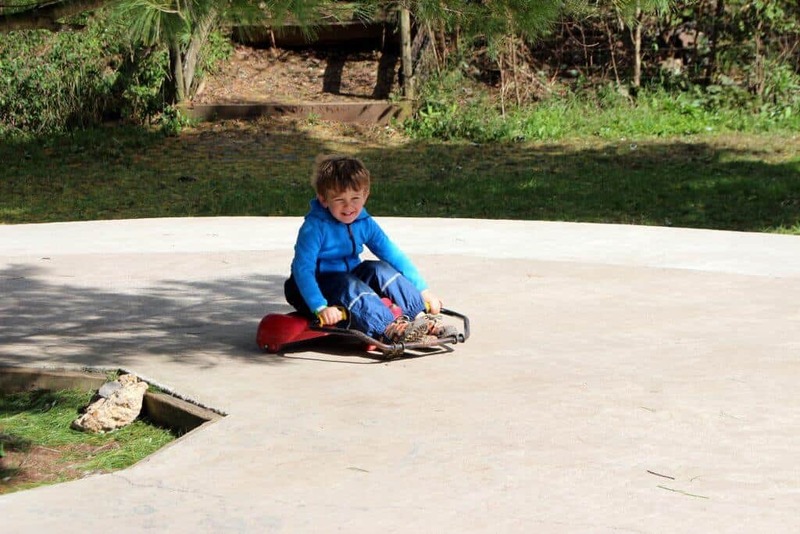 It took a bit of practice, but soon our son was whizzing around the track with the big kids. It’s amazing how fast they figure things out. There are animals scattered throughout the Farm. 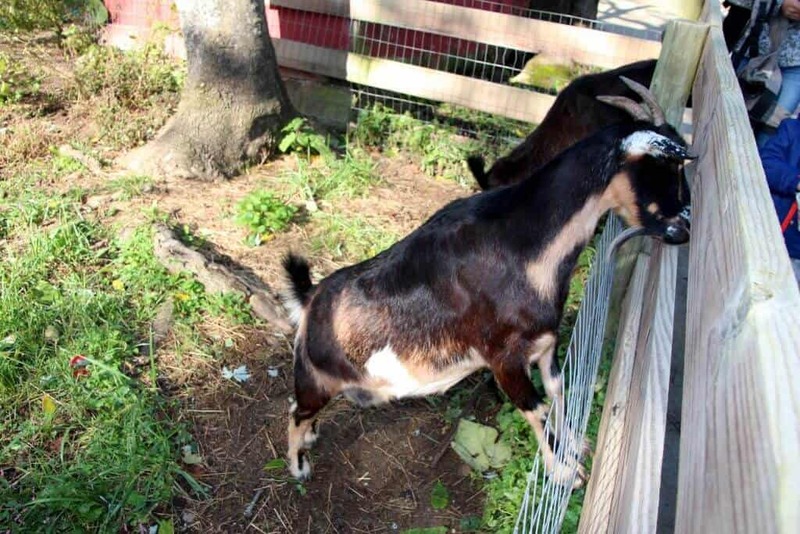 You can get a cup of food from the little dispensing machines to feed the multiple goats, chickens, and roosters. 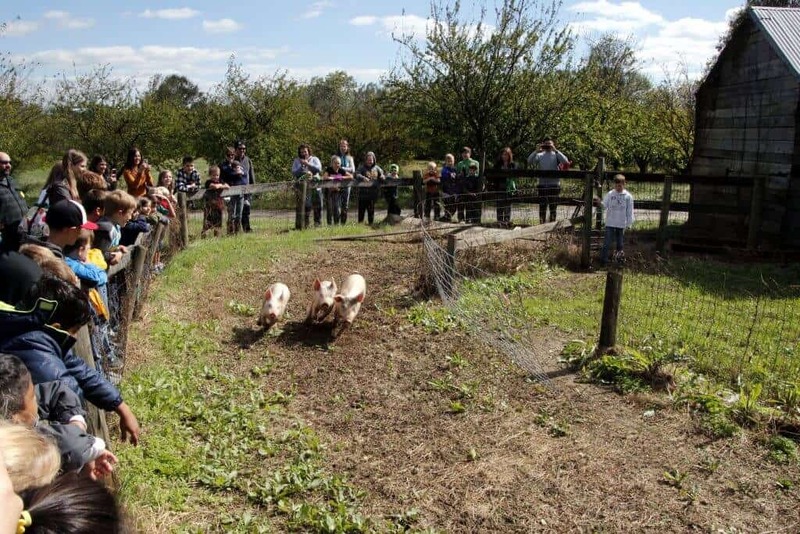 Fancy a pig race? Check the schedule. On the weekdays, there was a fun pig race at 12:30 pm. Be sure to get there a bit early to find a spot. There were three races and they pick a volunteer from the crowd to ring the bell. 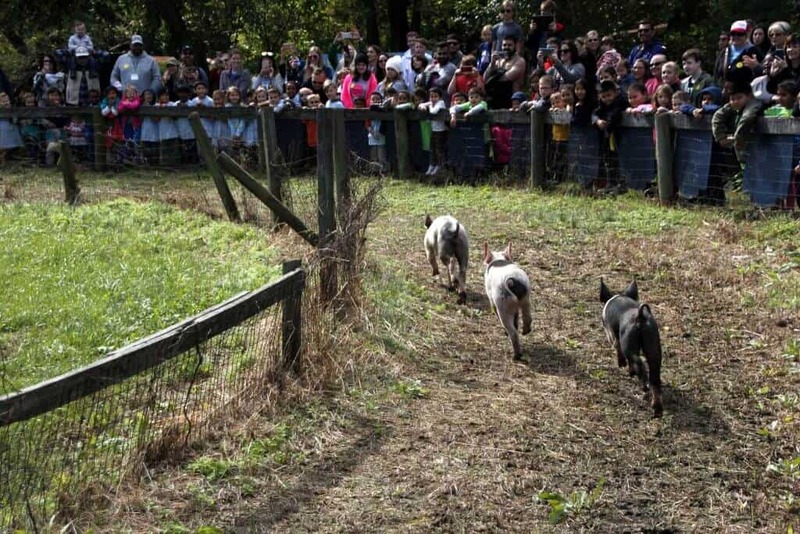 If you’ve never seen a pig race, it’s a fun event to check out. After all that playing, it was time for lunch. I was pleasantly surprised by the menu. We shared a cheese flatbread and salad. We added in two apple cider donuts and it was a perfect meal enjoyed on the picnic tables outside. You are also welcome to pack and bring your own lunch if you’d like. Plenty of places to enjoy your meal and they had large covered areas for groups and families to reserve ahead of time. 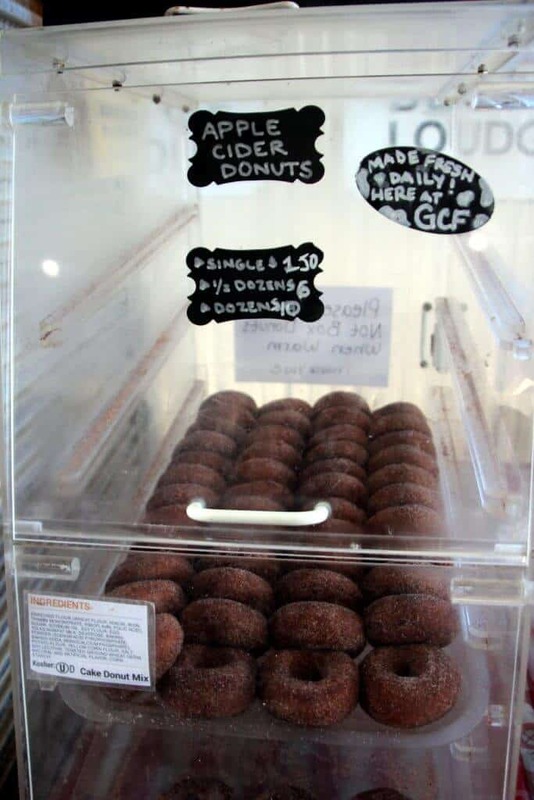 Be sure to grab some apple cider donuts, they are some of the best we’ve ever had. Especially if you catch a fresh batch warm right from the oven! We’ve been to a few farms with the mining set up. It always looked fun and while we waited for our food to be cooked, my husband and son paid for a bag to have fun outside. I purchased the gem back for $9 and was surprised and how large the stones were. Perfect for a toddler or preschooler to mine for some fun new gems to add to their rock/stone collection. You can purchase the bags at the restaurant or in the market shop on arrival. 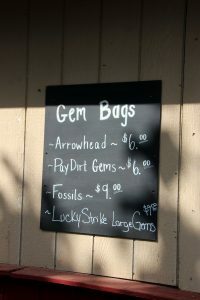 Re-use the bag for your gems or fossils at the end of mining. We did not take part in their fishing, but you can catch and release from their ponds. We also saw fishing poles and supplies for sale inside the market shop. Do you have a tractor fan in your family? 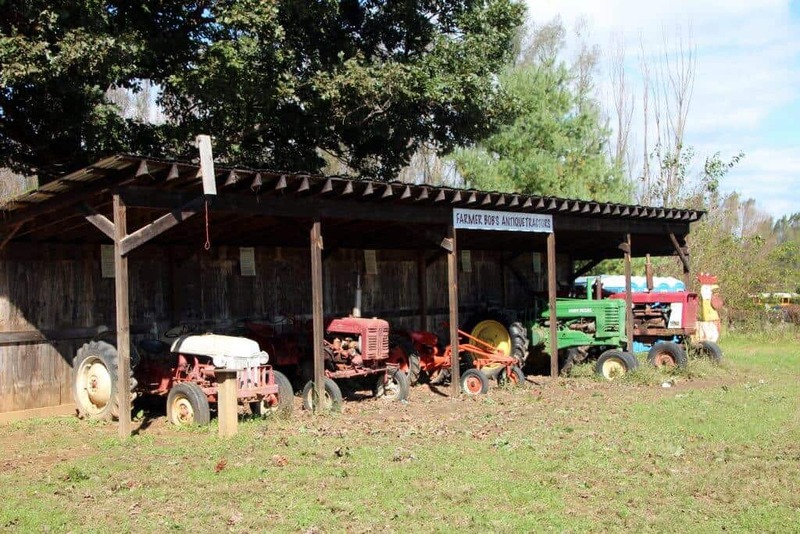 Then don’t miss the fun tractor museum. 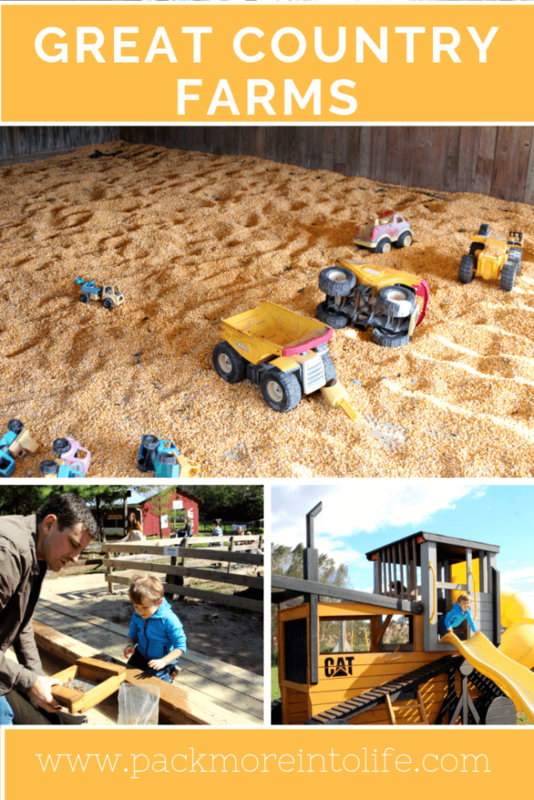 It features informational text and fun tractors to explore. The moving parts were a delight for our little one! Check their website, but we saw many organized activities from school and homeschool groups. 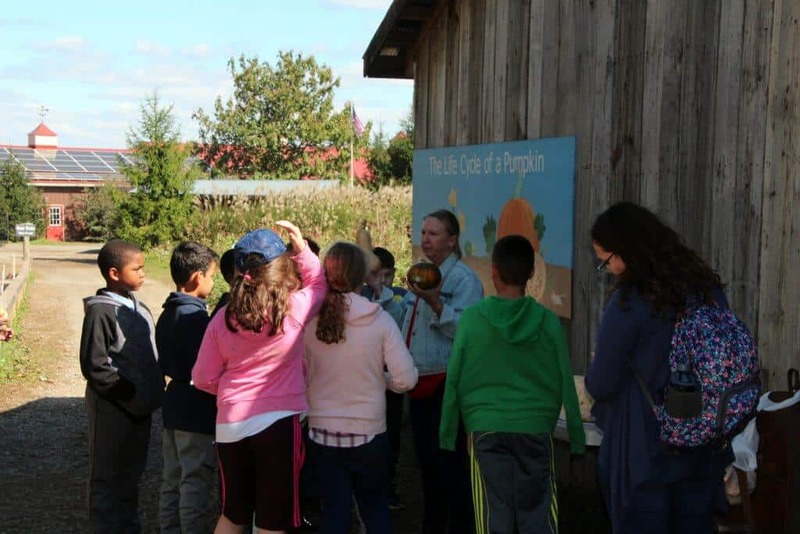 One group was learning about the lifecycle of pumpkins as well as about various squash/gourds. 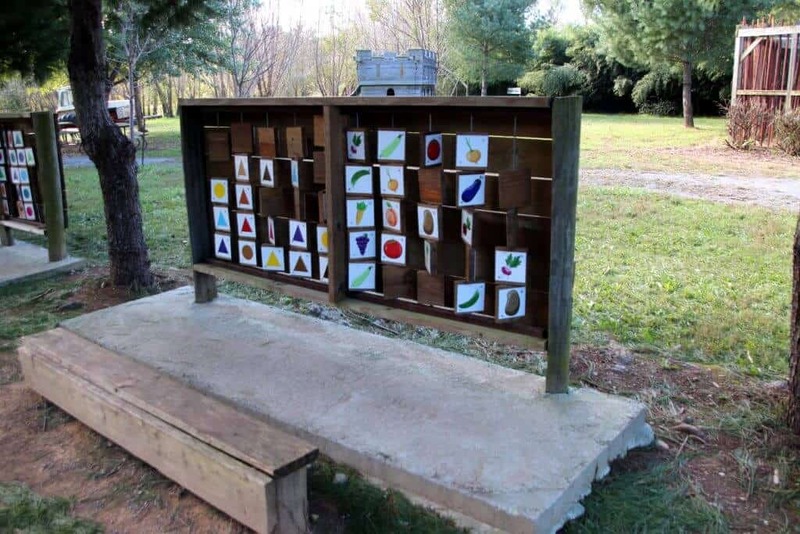 The farm has lots of education displays for the children, even if you aren’t on a tour. If you’d like, you can catch either of two tractors to be taken out to the fields in order to do some fun apple picking or pumpkin picking. We did not take part in this activity because my husband was eyeing the brewery that was just up the road, check out that post HERE. <——- Beer tasting!! 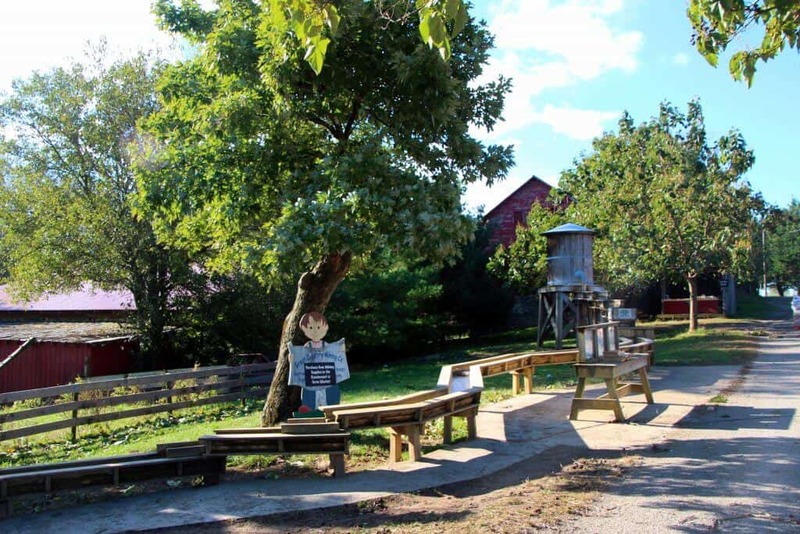 We had also gone apple picking a couple of weekends ago if you want to read more about apple picking at Stribling Farms, check out our Fall Guide here. <——- Apple Picking!! There are multiple bathrooms around the farm and they are traditional bathrooms (not porta potties). 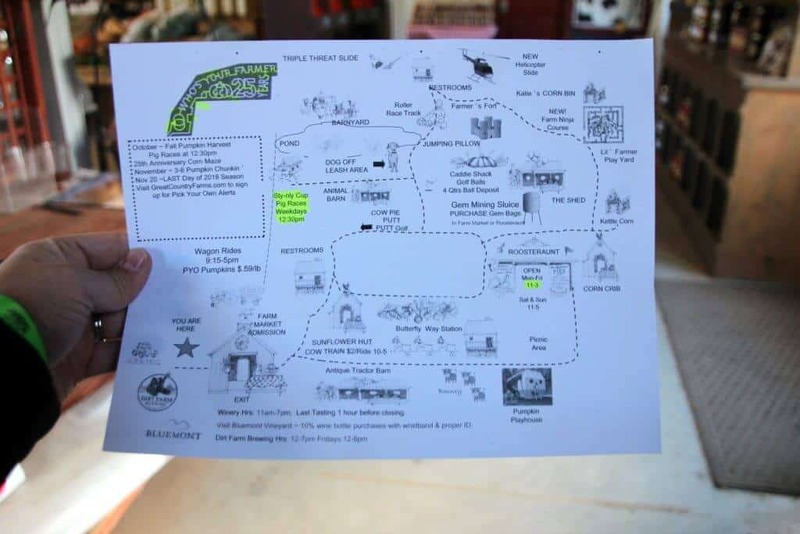 Make sure you grab a map so that you can locate them easily. The bathrooms were clean and well stocked with changing tables. We had a good time at Great Country Farms. 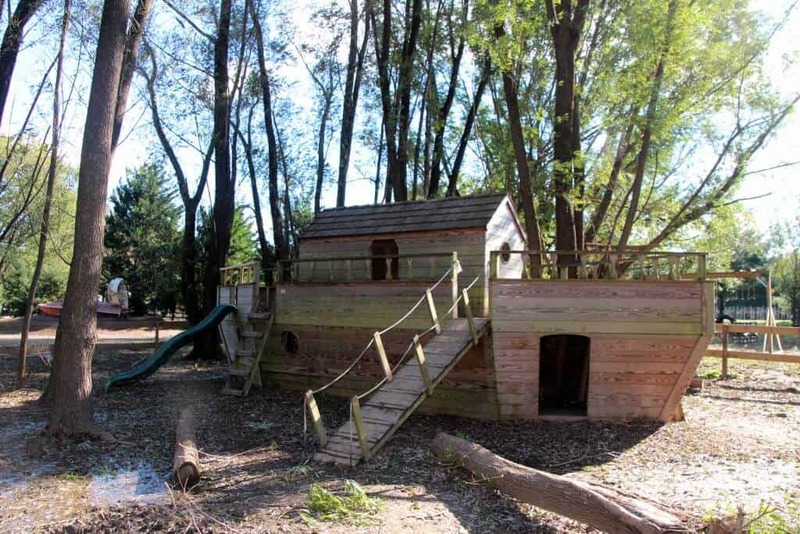 We find it best for families with kids of multiple ages due to their variety of play areas. We saw toddler up to pre-teens having a good time. We had hoped the farm would do a bit more to mitigate the mud issues. The slides weren’t wiped down and there were puddles all around. It has been a really wet year this year, but tossing down some hay or sand would have been nice. 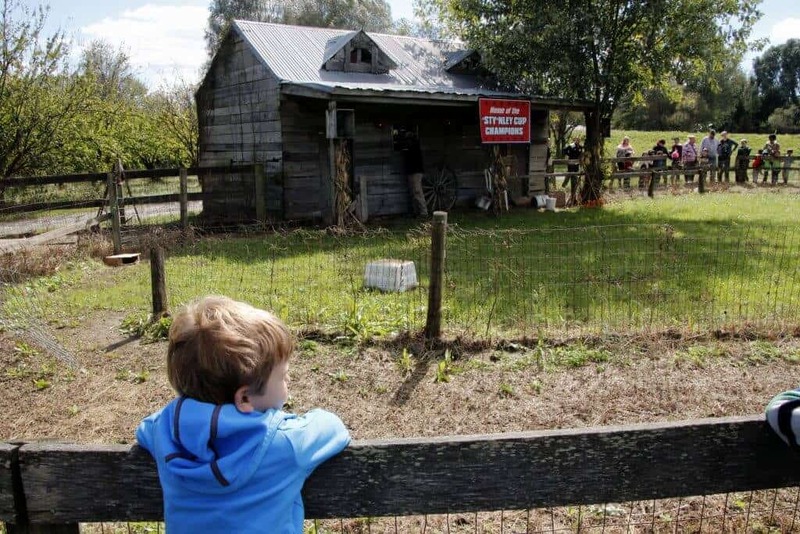 Also, don’t expect ride attendants (if you are used to Cox Farms), we didn’t see any staff or attendants around the farm, so its best to keep an eye on your kids. 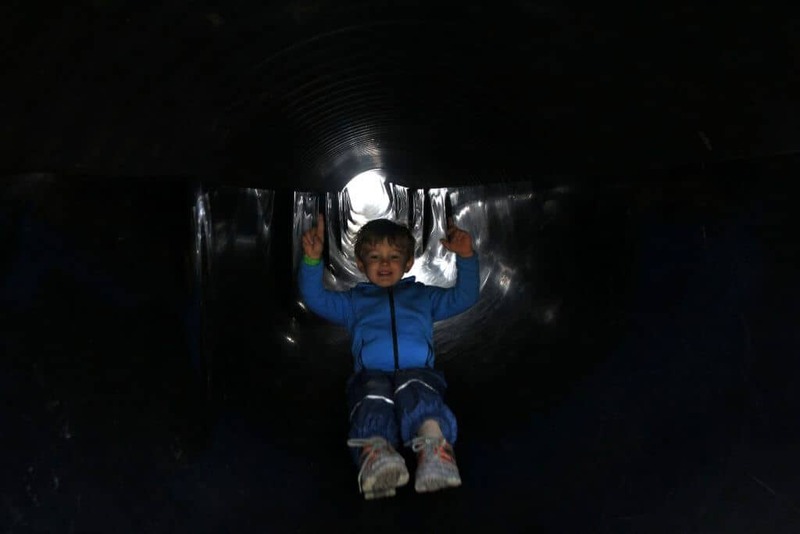 This is really only a concern on busy weekends when little ones are using the larger slides. 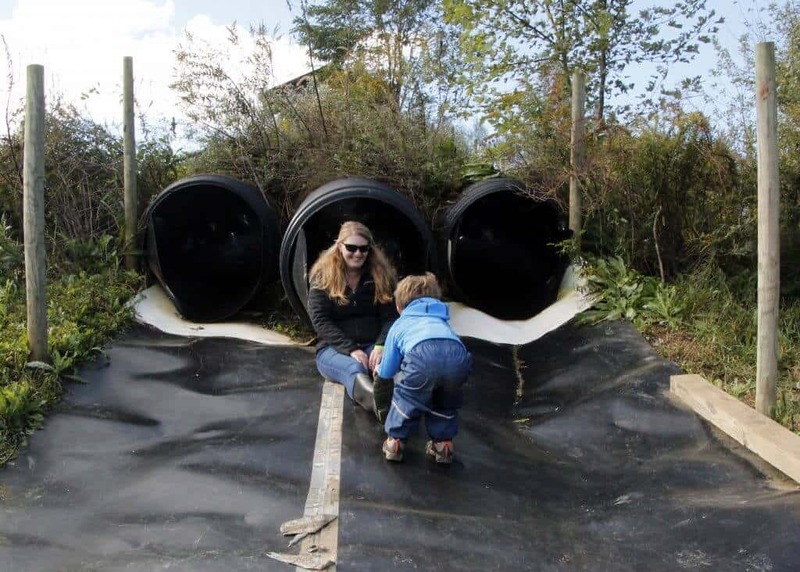 Want to read about more Fall fun in the DC/Virginia area, head back to my Fall Favorites post (coming soon). Or check out all the destinations we have traveled to on our interactive map.